XPC is one flavor of the Inter-Process Communication technologies provided by Apple. Our goal is to understand how the NSXPConnection API is implemented and utilized. From the serpent’s mouth, the NSXPConnection API is used to create lightweight “helper tools”, called XPC services . Let’s check out the XPC services that come bundled up with the CleanMyMac 3 application. drwxr-xr-x 4 rotlogix staff 128 Feb 9 08:47 .
drwxr-xr-x 12 rotlogix staff 384 Feb 9 08:47 .. The LipoService looks pretty interesting! After some investigation, I discovered that this service simply wraps the lipo command itself. If we give the application a spin, we can see that the service has been launched. Let’s dive into LipoService and see what XPC stuff is going on under the hood. In order to create an XPC Service using the NSXPCConnection API you will need to configure a listener object . // The resume method never returns. If we check out LipoService's imports, we can observe the existence of the NSXPCListener class! The class NSXPCListener contains a single cross reference, originating from the start function. The next requirement for creating an XPC service is creating a connection delegate class that conforms to the protocol NSXPCListenerDelegate . This class will be responsible for delegating to the XPC listener the ability to accept or reject new connections. This connection delegate will be the class CMLipoServiceDelegate. The method shouldAcceptNewConnection is responsible for handling new inbound XPC connections, which takes the form of the class NSXPCConnection. The method shouldAcceptNewConnection is also responsible for setting up everything the XPC service needs for performing the operations sent to it from an XPC client. 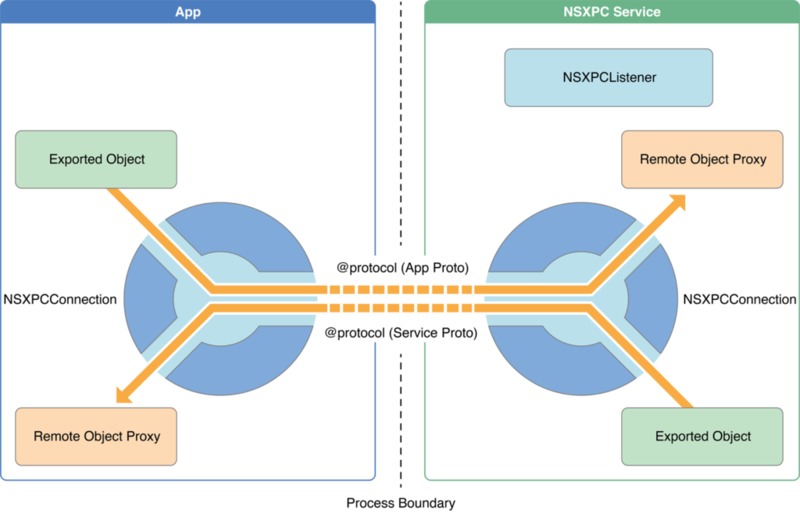 The Objective-C NSXPCConnection API provides a high-level remote procedure call interface that allows you to call methods on objects in one process from another via the XPC service . Within the CMLipoServiceDelegate class’s shouldAcceptNewConnection implementation, the CMLipoprotocol is used to initialize the NSXPCInterface instance. A quick and dirty way of identifying all of the methods provided by the protocol CMLipo in IDA is inspecting the protocol’s Objective-C method list. The exportedInterface will conform to the CMLipo protocol it was created from. The exportedObject will end up being the CMLipoTask class, which is set via the setExportedObject method. We’ve also observed the obtainArchitecturesForBinary:withReply: method in the CMLipo protocol’s Objective-C method list. So, it should be clear that the CMLipoTask is responsible for implementing the methods within the CMLipo protocol. If we kick off the CleanMyMac 3 application, we get the following output. VerSprite's Research and Development division (a.k.a VS-Labs) is comprised of individuals who are passionate about diving into the internals of various technologies. Our clients rely on VerSprite's unique offerings of zero-day vulnerability research and exploit development to protect their assets from various threat actors.